Well, here it is! 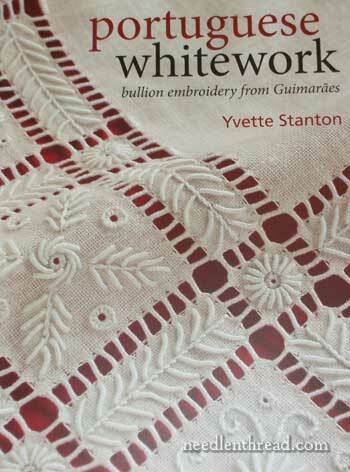 Yvette Stanton’s new hand embroidery book, Portuguese Whitework: Bullion Embroidery from Guimarães is out and available. And golly! It is beautiful! 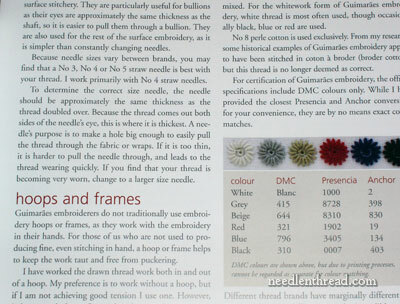 If you’re familiar with Yvette’s other books on various types of lesser-known, beautiful whitework techniques, you won’t be surprised that this one is superb. I have to say, though, out of all her whitework books, so far, this one is my favorite. Perhaps it’s because her books just keep getting better and better, or maybe it’s because I have an affinity for the combination of drawn thread embroidery and surface embroidery. Guimarães embroidery just does this combination so well! 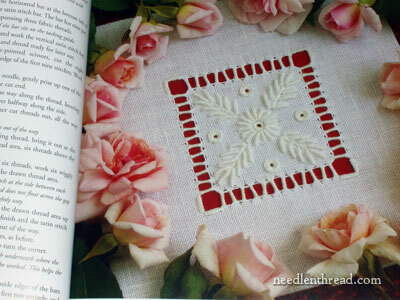 Let me show you what’s in the book – if you like whitework, this is bound to tickle your fancy! Portuguese Whitework: Bullion Embroidery from Guimarães is a combination instructional manual / project book. As you can see from the cover, bullion knots and drawn thread embroidery figure into Guimarães embroidery techniques. 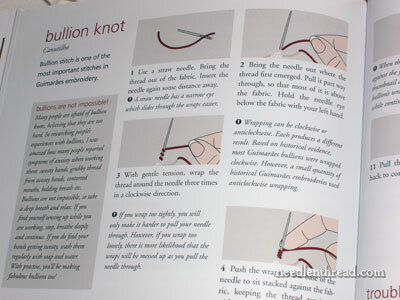 If you’re not a fan of the bullion knot, don’t be intimidated! Really, they just take practice, and Yvette offers clear instructions and all kinds of encouragement to help you get your bullions right! 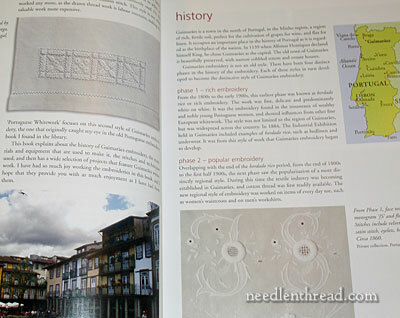 The book begins with an explanation of what Guimarães embroidery is and what it entails, followed by a nice history of the technique. I always appreciate a good history of regional techniques. It helps place the technique in context and gives it roots. I like that! Yvette peppered the history section with some beautiful examples of embroidery from the Guimarães area of Portugal, so you can get a sense of where this style of embroidery is coming from, how it has developed, and how the embroidery has been used. Following the history section, we get materials – all the supplies you need to work up your own Guimarães embroidery projects. There’s an explanation, too, of the colors often used in Guimarães embroidery. Not all Guimarães embroidery is whitework, per se, but Guimarães embroidery is typified by a very limited palette of colors, and Yvette explains all that so that there’s no confusion. Then we get into the meat of the book! The book is really structured around the projects, which cover a whole range of levels of work. From smaller, simple bookmarks to elaborate tablecloths and samplers, there’s something in this book for everyone. Do you want to work up a quick weekend project? Or do you want to create a Monumental Masterpiece that will take a bit more time? You’ll find both, and lots in between, among the projects. …. 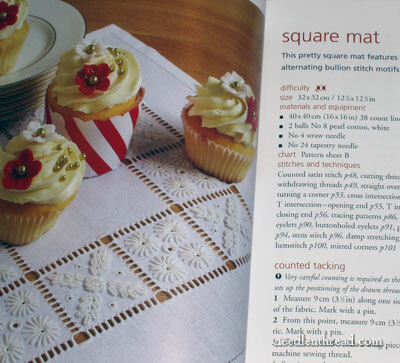 and slightly larger projects, like this square mat (cupcakes not included) to challenge you further. … a sampler (my favorite – would love to work this! )… and bookmarks, a cushion, a hand towel. Lots of projects to choose from, and something for everyone. Each project is accompanied by instructions that take you step-by-step through the project. The instructions are mostly text, with diagrams when necessary. 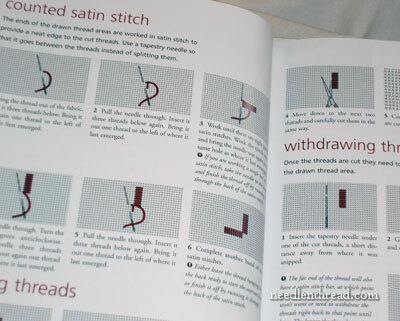 The actual instruction, though, in the embroidery techniques, is all presented in the second half of the book, in clear, step-by-step diagrams. 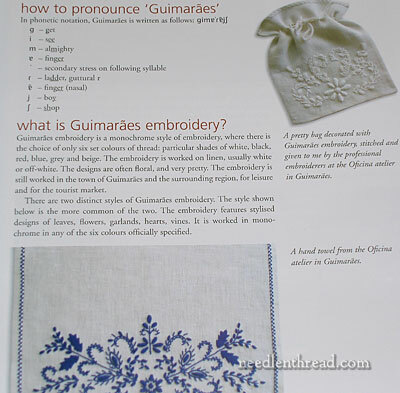 The technique instructions are divided into drawn thread embroidery instructions and surface embroidery instructions, since Guimarães embroidery is made up of both. The drawn thread instructions concentrate on overcast bars, addressing all types of arrangements of overcast bars thoroughly. Yvette takes the stitcher through every step of each technique, showing you how to turn the corners, how to secure the threads, where to hold your stitches and what’s going on under your fingers while you’re holding them, where and how to start new threads, and so forth. These are the little details that set her books apart – she really covers everything and she doesn’t leave you wondering. The drawn thread section is followed by surface embroidery instruction, which covers all the surface embroidery techniques used in Guimarães embroidery. The instructions here are also presented with step-by-step illustrations. 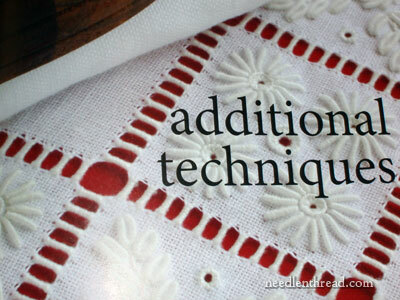 And then there’s a little section on additional, helpful techniques, which addresses some finishing questions, like damp stretching, hemstitching, preparation for framing, and so forth. But wait! There’s more! Patterns, of course! The patterns for the projects are printed on separate sheets that are folded into a plastic sleeve affixed to the inside of the back of the book. I probably don’t have to tell you this is a lovely book – you can see that for yourself! 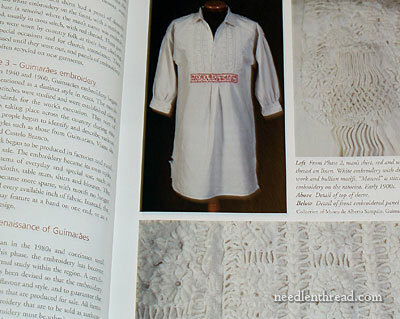 If you love whitework, drawn thread embroidery, or regional embroidery techniques from around the world, put this book on your list! It’s a great project book and a great instructional book. 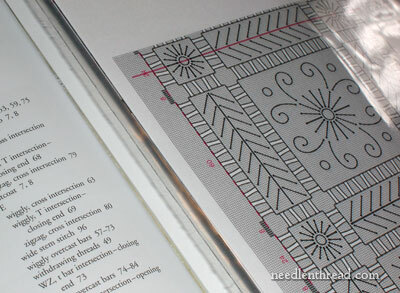 In fact, the instructions are definitely universal – they’ll transfer to all types of embroidery techniques. 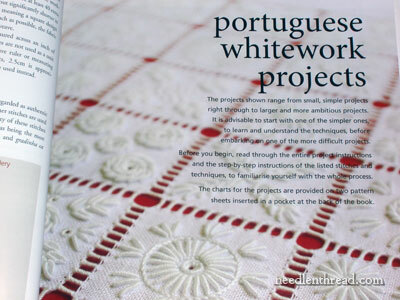 Worldwide with free shipping, you’ll find Portuguese Whitework available here through Book Depository. There is just something about whitework that has always called to me. Even when worked with the simplest of stitches, it has an elegence about it. You are right the techniques can be used with other embroidery and adding those different stitches can make a piece sing. I love the texture of this work. Thanks for your book review–I definitely came away with book-lust. Based mostly on your review (since there aren’t any bookstores around anymore to browse), I just got Color Confidence in Embroidery by Trish Burr. My, oh, my but this is a wonderful book. Thanks! Gorgeous work, every bit of it. Did anyone else cringe at the sight of cupcakes sitting on that lovely piece? I don’t think I could even bring myself to put pins it it, let alone, risk soiling it on a table. Too lovely. The book sounds very well thought out. Jusa, believe me, I was VERY careful when photographing the cupcakes on the embroidery! Wow – what an amazing book. You do a very thorough job of reviewing and I really enjoy reading your comments. It makes a difference as I do order quite a few books over the internet and it is nice to have such a detailed review so I can know what to expect (and not be disappointed). 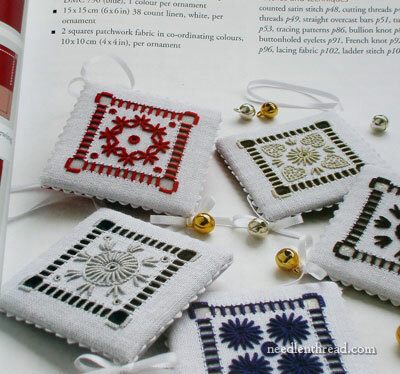 I agree with your choice of the sampler as a favorite but I would also really enjoy making the Christmas ornaments. I really enjoy reading your daily posts. Thank you! Muito obrigada por promover este livro e nomeadamente os bordados portugueses. Adorei! Oh no – another book that is going on my must-have list! With my current fascination with working in white I know I will have to have a copy…sooner, rather than later. I love bullion knots and could do them all day and have been teaching myself a bit more drawnwork and would love to learn more. I have wishlisted this book already. Thank you for letting us know which sites are carrying it as amazon isn’t even giving a release date yet. What lovely work! I forgot to add that I own Yvette’s amazing book on Mountmellick. Her instructions are amazing as are her designs. I am working on adapting her amazing florals to a 16 x 16 inch cushion design right now. Her books really are lovely. I feel very lucky to have a copy of this book as it is now out of print and used copies are commanding ~$75. I’m so glad you love the book – thank you for your lovely comments. In case anyone else likes the sound of it, it is still available – the fully revised edition came out a few years ago, and is still sold worldwide. So there’s no need to feel like you’re missing out! Mary, thank you for this Book Review its gorgeous! 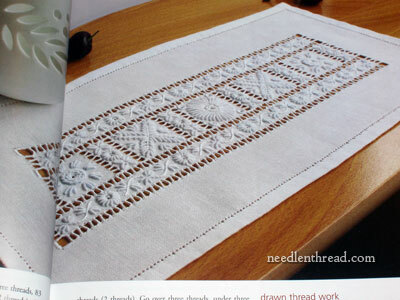 I was wondering what kind of thread is used in Portuguese Whitework? 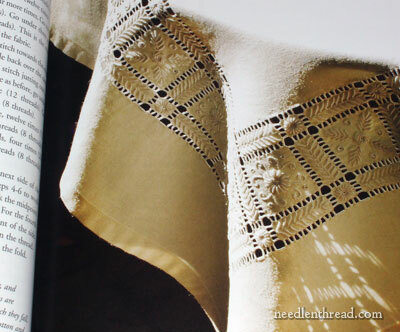 Those bullion stitches from Yvette’s book are incredible. You’re almost in the home stretch for your medallion project. It’s looking great. Dawn, it is pearl cotton 8. Yvette’s book looks great. As well as being beautifully presented this compilation about Portuguese Whitework: Bullion Embroidery from Guimarães as a traditional needlework style, with information on its origin and instructional details on stitch techniques, is an important preservation of history. As time passes more of the intended original expression and knowledge of early needleworkers, and other information about the art style is lost, then sadly, remaining historical examples are misidentified or just lumped as whitework. Yvette brought us back to Mountmellick embroidery and now another whitework treasure. Lots of work done with love. Well done. I love it too. Thanks! Great price and free shipping at fishpond.com — a site I discovered a few weeks ago. The book I ordered arrived from Great Britain in 12 days! And now this one is on the way. Thanks for the review. There’s something so refreshing, so clean, so romantic, so natural, so ‘easy’ yet so sophisticated about whitework. Especially as in this book. I love the individual motifs and their groupings. This book is superb. Thank you Yvette. And thanks Mary for doing the book justice. That’s curious, I’m near Guimarães and I’m sure that if I ask for a book of their embroidery they don’t find one!!! Just ordered Portuguese Whitework from Book Depository for $24. Beautiful ! Who could not love whitework? Whitework is something that I have always admired but not always something I have enjoyed doing. While white on white looks stunning in a finished piece, I have found some of it very monotonous to do and very tiring on the eyes. However, I do love doing bullions so this book peeked my interest when you first reviewed it. The projects are ispiring and look very do-able. It is always interesting to learn about new technigues especially those that have developed in a particular region of the world. I think I may just have to add this to my wish list of books. Thanks for sharing and for the opportunity of winning. I was fascinated to discover this type of Portuguese embroidery and immediately started some internet research. I love the white on white work but was interested to discover the embroidery worked in other single colours as well. The book looks to contain a wealth of information from history, techniques and ideas. Thank you for reviewing this great book, it went straight on my amazon wish list! There is such an elegance and impact with whitework or indeed any mono coloured embroidery. This style jumped out at me, as it includes my most favourite stitch – bullion! Thank you for the wonderful & detailed book review. This work is exquisite!! 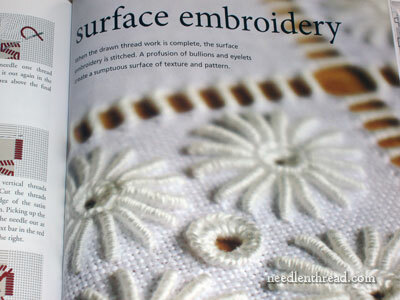 I enjoy embroidering & this book is a must have. I wish each day were 72 hrs of day and 8 hrs of night! I want to do it all! You make me what to try everything. Thanks for the inspirations. Está no Brasil ou em Portugal? Hola Miriam, Amazon tiene el libro: http://www.amazon.com/Portuguese-Whitework-Bullion-Embroidery-Guimaraes/dp/0975767755/ref=sr_1_1?ie=UTF8&qid=1372731764&sr=8-1&keywords=Portuguese+Whitework%3A+Bullion+Embroidery+from+Guimaraes+%28Paperback%29. Ofrecen el envío hasta el D.F., pero mejor consulta los precios; otra opción es pedir que te lo coticen en book.com.mx, ellos están en Tijuana y el costo de envío es bastante atractivo. Saludos! 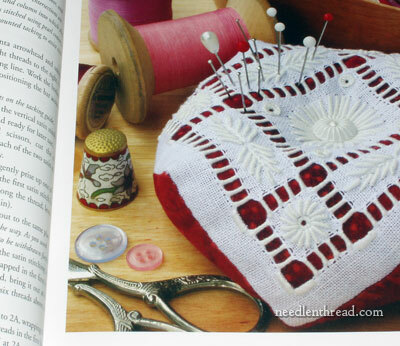 Have you heard of Yvette Stanton’s new book “Sardinian Knotted Embroidery” – to be released in mid to late 2014? Hi, Shaz – yep! I’m looking forward to it – looks lovely! 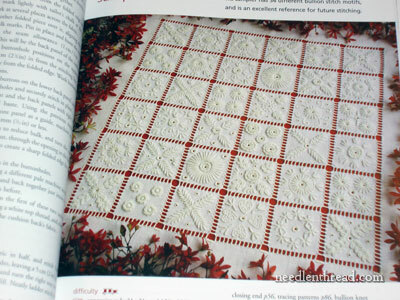 Next Next post: Portuguese Whitework – Book Give-Away!